Last year during Hurricane Harvey, the wettest and most costly typhoid storm that has ever come out of the Atlantic, I was reminded of the story from the Great Galveston hurricane and flood of 1900 as told by Dr. Robert Sloan, President of Houston Baptist University. Upon taking the helm at HBU, Dr. Sloan introduced a plan for the future of the university that began with a story that referenced the parable in Matthew 7 of the men who built their homes, one on the sand and one on a rock. Sloan told of a man in the autumn of 1900 who lived in a thriving city on the Texas shore. People came from far across the ocean to visit this growing city, as it was a rising center for commerce, innovation, and trade. One day, with no warning, since those were the days before forecasts and radar, the winds became a wild thing, and the sea began to rise. A great storm was coming, and the people of Galveston were not prepared. The man and many of his fellow citizens took shelter at the courthouse, where his father was a judge, behind the thick granite columns that held up the house of law. They prayed for the best. Like the house built on the rock in the Matthew 7 parable, the rain fell, the flood waters rose, and the wind blew and slammed against the building, but the pillars held. Today, we can see ten of those same granite columns at the center of the HBU campus, a gift from the survivor’s son. Given in the fall of 1969 at the height of the Cold War and cultural upheaval in the United States, they are more than mere relics of the past. They are a constant reminder that the ability to weather fierce storms depends upon solid foundations. People of wisdom build their houses upon solid foundations. If we establish and commit to living out biblical principles for our marriages relying on God for strength, we will see love grow firm even during the struggles of life. Here are some Biblical areas of marital love to evaluate for building into our relationships and if missing to install as pillars to weather upcoming storms that interfere with our love. Choose faithfulness and determine that divorce is not an option. As Hebrews 13:4 begins in the NET version “Marriage must be honored among all and the marriage bed kept undefiled.” In Ephesians 5, Paul references Genesis 2:24, “two becoming one flesh” for which John MacArthur notes that “’One flesh’ speaks of a complete unity of parts making a whole.” God has established marriage to be a permanent commitment pointing the world toward the union Jesus has with His church. This is “Till death do us part.” Healthy marital oneness is a reflection of the interaction that we are designed to have with God Himself. Oneness includes an eternal covenant, a purity in thoughts of and for each other, intimate moments, and outward expressions for others to see. However, oneness is not losing oneself in the identity of the other person. Consider how we, in our marriages, can demonstrate commitment and exemplify oneness. We can ask in prayer for God to lead a deep discussion of Ephesians 5 to examine these potential pillars. Commit to developing patterns of communicating truth in love. Instead of a focus on negatives that destroys trust and unity, affirm areas of fondness and where growth has occurred. Communicate clearly about feelings, struggles, and requests with reflective listening that doesn’t assign motives or attack character. Show respect and practice healthy coping skills in reacting to and communicating through conflict instead of escaping, escalating or eroding trust with invalidation, avoidance, or distortion. Take a look at how 1 Corinthians chapter 13 lists attributes of agape love that God can build into relationships. Love includes transparency, vulnerability, service, and submission, not selfish attempts to meet needs through our spouse or to get them to make us feel good, to find a buzz, or to gain significance. Again, the goal is not to pursue our spouse to get what we want, to regulate our emotions, or answer, for us, questions about our identity or security. Christ can do that through our spouse, but if that is our end-game, it will strain the relationship or turn it into an idol. Let us make efforts to discuss what needs exist in the relationship, we can prioritize them in a discussion like we would the Five Love Languages (Gary Chapman) and learn how to be sensitive to times when they can be met through the relationship or when God needs to provide other means. This ties back into the passage of Christ laying down his life for the church. Not only should we commit to extending God’s grace to our spouse by quickly dealing with areas needing forgiveness, we can bless them in another way by forgiving and restoring other relationships as well. Practice an atmosphere of forgiveness, let us discuss a Biblical model of forgiveness and learn a restoration process. One good source of this is Ken Sande’s Peacemaker information which can be found at http://peacemaker.net/project/the-four-gs/. Much prayer should go into the forgiveness process in order to receive God’s strength and wisdom to make it possible to deal with the emotions of the wound and the choice to restore, just as it should in the other pillar areas. In summary, find and agree to pillars that mark what it means to be healthy, stable and provide a foundation for growing. Much like the pillar of cloud by day and fire by night that led the children of Israel through the wilderness, these should symbolize God’s leadership in our marriages and remind us and others of his presence in our marriage when storms strike or wilderness threatens the relationship. Let’s consider asking each other how we are doing in these areas and how we can grow or even how to begin to install these into our marriage edifice. 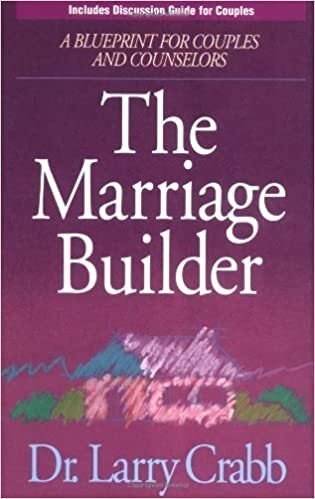 If I could point us to a couple of books to complement our Bible reading, I would encourage Larry Crabb’s The Marriage Builder, and A Lasting Promise, by Scott Stanley, Daniel Trathen, Savanna McCain, Milt Bryan. What Attention Should We Give The Devil? Wells Counseling Services is Aggie Owned and Operated, founded by David Wells, class of 1992.